posted by Billie Owens in events, oakfield-alabama. A prom fashion show is being presented by the Junior Class at the Oakfield Alabama Middle/High School Auditorium beginning at 6:30 p.m. on Friday, April 19. Tickets are $10 and refreshments are included. "Step into Prom" will also feature assorted vendors, discount coupons and a huge basket raffle. The school is located at 7001 Lewiston Road in Oakfield. posted by Howard B. Owens in schools, education, Oakfield, oakfield-alabama, Alabama. An Oakfield-Alabama Middle-High School senior has been named to Business First's 2013 All-Western New York Academic Team. Jennifer Crossen (First Team) has qualified for this year's list of the 100 most outstanding high school seniors in the eight-county region. "This is an extremely exclusive award," said Jack Connors, president and publisher of Business First. "There are roughly 20,000 seniors in Western New York's high schools, and we've selected only 100 for this year's Academic Team. That's the upper one-half of 1 percent. They're truly the best and brightest students anywhere in our region." The complete list of 100 honorees -- along with their photos and profiles -- will be published in Business First's 2013-2014 Guide to Western New York Schools, which will hit newsstands on June 14.
posted by Howard B. Owens in batavia, football, sports, Oakfield, Notre Dame, oakfield-alabama, Alabama. Coming off two disappointing seasons and starting the 2011 season 0-2, it would be easy to dismiss a game against Oakfield-Alabama as a bye week, but as any coach in the Genesee Region will tell you, there's no squad in the league that can be taken lightly. There's no telling if the Fighting Irish took the Hornets a little less than serious coming into Friday night's league match-up, but O-A's young players certainly made a game of it. The final score was 29-14, but the Hornets were never really out of it until the final minutes, and at the half looked like a team that could spoil Notre Dame's early season perfect record. "They're very well coached," said Notre Dame's head Coach Rick Mancuso. "Brian (Palone) is doing a great job. That (Tommy) Manzella kid is a terrific quarterback. They're tough, there's no doubt about it. They spread you out all over, they throw the ball. I give them all the credit in the world. I thought they played very well tonight." Palone said his team is young. They let the game get away from them when Nate Woods returned a punt 50 yards for a TD, making the score 15-14 following a two-point conversion. "That changed the momentum," Palone said. While Manzella showed he could still march his offense down the field -- he passed for 192 yards on the night on 27 completions -- the Hornets couldn't finish the deal in the red zone. "Overall I fell like we were right in there," Palone said. "Our kids were fighting hard just like we ask them -- 'give 110 percent.' We’ve got a lot of sophomores out there. We’re just very young this year, so we’re going to make mistakes, but we’re just going to learn from our mistakes and improve." The scoring started in the first quarter when Nick Taylor capped a Notre Dame drive with a 16-yard run. But O-A's no-huddle offensive helped the Hornets get the momentum back and the defense was being pretty stingy, twice intercepting Tim McCulley. Two O-A drives in the second quarter ended in TDs -- a three-yard run by Manzella and a two-yard pass by Manzella to Chris Nanni. By the fourth quarter, Notre Dame's running game was nearly unstoppable. Taylor finished the game with 87 yards on the ground on 17 carries. Nick Conklin had 82 yards rushing on 11 carries. ND's two fourth-quarter TDs were a five-yard run by Taylor and Woods hauling in a 25-yard pass from McCulley. McCulley finished with 107 in the air on 16 completions. Mancuso said his young team played two great quarters to start each of their previous games and then "sort of frittered it away" in second halfs, but Friday the team played better in the second half than the first. "With a young group of kids like we've got, that's what you expect," Mancuso said. "I want to get us to the point where we're playing four full quarters of football." As for O-A, which was shut out three times in 2010 on its way to a 0-7 season, following a 2-5 campaign in 2009, Coach Palone is disappointed in his team's 0-3 start, but he said he's seeing progress for the Hornets. "I feel like this program is heading in the right direction," Palone said. "Every day and each and every game you can see that we’re improving. We’re hanging right in there with these teams now, where last year and the year before we weren’t right in there with the games. They were breaking the games wide open. This year, we're right there." posted by Howard B. Owens in schools, Oakfield, oakfield-alabama, Milestones. Betty Zaffram celebrated her 90th birthday this afternoon with the cafeteria staff of Oakfield-Alabama Central School. After more than 50 years of service to the school district, Betty is retiring. She returned to work today after recuperating from surgery, just in time to celebrate her birthday with her co-workers. Photo submitted by Bernadette Easton. posted by Billie Owens in education, elba, oakfield-alabama, literacy, richter family foundation. A unique, free book program -- offered by the Dolly Parton Imagination Library -- is going to be offered to children living in the Elba School District and registration begins Monday, July 12. It's for infants to age 5 and has been offered in the Oakfield-Alabama School District for about six years. Imagination Library's goal is to provide every preschooler enrolled with his or her own book collection. The books are carefully selected and mailed once a month to the child until age 5. Locally, the program was dubbed the "R.E.D. Express" by the Basom-based Richter Family Foundation, which has given away approximately 13,000 books to the program so far. The mascot of the R.E.D. Express is a choo-choo train. R.E.D. stands for "Read Every Day." In fact, the Richters formed their nonprofit foundation (a 501c3) in 2004 specifically to offer this program in Genesee County. Now, they are eager to spread this learning opportunity to more children, this time in Elba. "Our hopes are to get to the whole county eventually," Tim Richter said this afternoon. Dolly's Imagination Library program operates in 46 states, Canada and the United Kingdom. This year, the 25-millionth book will be mailed to some fortunate tot. The country superstar started this program in her birthplace, Sevier County, Tenn. She never forgot her dirt-poor beginnings. Growing up, she says she could only dream of owning her very own books. Today, she wants children everywhere to feel the excitement of getting a new book delivered every month -- to keep! So she decided to replicate the program in any community willing to support it financially. The Imagination Library partners with nonprofits to promote literacy. It starts the program in a community where a bona fide nonprofit foundation is capable of receiving donations on its behalf. Businesses and other donors help financially support the program via the nonprofit, which supplies informational brochures, handles administrative duties and serves as the liaison with Dolly's foundation. Parents and guardians, of course, must register their little ones and help them learn to read. In Oakfield-Alabama, the Richter Family Foundation has funded the entire program without sponsors, but that will not be feasible as the program grows. Thus, Elba businesses and residents are encouraged to participate. "Get in on the excitement and opportunity to help the children of your community," says Linda Richter in an announcement about the R.E.D. Express. All children who are 5 and under are welcome to participate and parents are encouraged to pick up a registration brochure at the following locations: The Elba School District Office, M & T Bank, Elba Village offices, Elba Town offices and the Yellow Goose Market. Simply mailing the registration form to the address on the brochure will enroll your child. To become the next reading depot and begin this program in your area, please call The Richter Family Foundation at 585-948-9675.
posted by Daniel Crofts in batavia, arts, Batavia Middle School, video, youtube, music, Le Roy, John Kennedy School, photos, schools, elba, robert morris, pembroke, Pavilion, Notre Dame, oakfield-alabama, jackson elementary, st. joseph's school, wolcott st. school, pembroke intermediate. For a year-end project, I thought it would be cool to take some video and pictures of music- and arts-related activities -- respectively -- in the Genesee County schools. The following video is 20 minutes long and divided into two parts (Youtube limits most users to about 10 minutes per video). It features concert footage from various schools in the county. posted by Howard B. Owens in crime, Oakfield, oakfield-alabama. A former Oakfield-Alabama band teacher admitted to an inappropriate relationship with a student on Thursday thereby avoiding trial on the more serious charge of sexual abuse, 3rd. Kerry Hoffman entered guilty pleas in Oakfield Town Court to endangering the welfare of a child and official misconduct. He will be required to give up his teaching credentials under the terms of the plea agreement, according to Assistant District Attorney Kevin Finnell. Hoffman made factual admissions, according to Finnell, of making several phone calls and sending several text messages to a teenage student, and to taking her to the mall without her parents permission. But he did not admit to inappropriate touching and kissing, which the girl claimed happened. Under terms of the agreement, Hoffman will serve two months intermittent incarceration and three years probation. 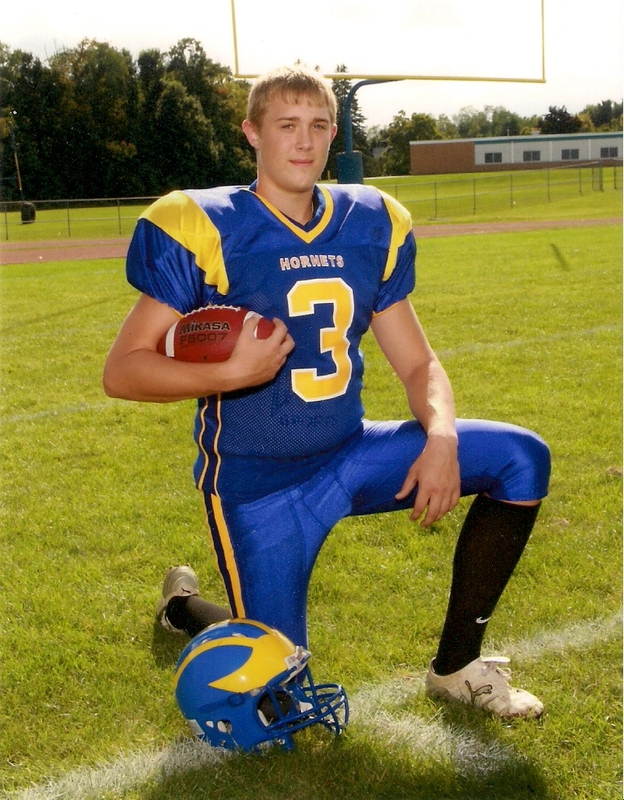 posted by Howard B. Owens in football, sports, oakfield-alabama, Jonathan Fisher. Five years of training and practice are starting to pay off for Jonathan Fisher, a punter for Oakfield-Alabama Central School. According to his father, Kurt Fisher, he's been invited to Senior Camps at Division I schools, such as Syracuse, Rutgers, Louisville, W. Virginia and Illinois. Currently, Fisher is ranked the #1 punter in New York on MaxPreps.com. "He's put in a lot of time and effort," said Kurt Fisher. "It's nice to see it paying off for him." This summer Fisher will be attending Senior Camps to showcase his talents in front of college coaching staffs. He finished the 2009 season with 19 punts for 888 yards and a 46.7-yard punting average. So far his invites for Junior Days include one on Feb. 20 at the University of Pennsylvania and on Feb. 27 at Syracuse. He'll also be participating in an upcoming session with college coaching staffs in Buffalo. Fisher is on the verge of striking the big time in college football a season after another O-A product, Matt Waldron, put together a big year as the #1 kicker at Virginia Tech. Waldron made all 58 of his point-after attempts and 20 of his 23 field-goal attempts, with only one of his misses coming within 40 yards. He scored 108 points for the year. At about 3:40 minutes into this video, you can watch Fisher practice his kicking during half-time of O-A's playoff game at Cal-Mum. posted by Daniel Crofts in batavia, school for the blind, Pavilion, oakfield-alabama, High School, fundraising. Everybody likes a little friendly competition, right? And if it's for a good cause, all the better! ...and here's the other half! High schoolers from all over Genesee County are getting involved in "Change for Change" (C4C), a fundraising project for United Way of Genesee County. Student government reps from Batavia High School, the NYS State School for the Blind, Oakfield-Alabama High School and Pavillion Central School gathered in the BHS auditorium Yesterday to kick-start the project. posted by Paul Teresi in Announcements, community, Oakfield, oakfield-alabama, cancer. The Leadership-In-Action Class at Oakfield-Alabama will be hosting a Going Bald for Bucks event for the Roswell Cancer Institute. You will have to collect donations from sponsors, and in return for these donations you will have the choice to have your head shaved to a clipper setting of one inch or you can have ten inches of non-chemically damaged hair which will be donated to Locks of Love. The shaving of the head is to honor cancer patients who lose their hair due to radiation or chemotherapy. If you are interested, the application/pledge form can be found at the Oakfield-Alabama High School location and on the Hornets website; www.oahornets.org. There will be a link called Bald for Bucks which will take you to the forms. The forms and money are due to the Oakfield-Alabama High School office by March 12, 2010. Make sure the pledge form is signed, and has sponsors listed for you. The date of the event will be March 26th, 2010 from 1:15pm-2:30pm. If you have any questions or concerns please feel free to contact Tracy Schlagenhauf or Cindy Kowalik at 948-5211.
posted by Paul Teresi in community, Oakfield, oakfield-alabama, cancer. posted by Paul Teresi in Oakfield, computer, oakfield-alabama, Alabama, Class, Leadership. Computer Class open to the public!!! posted by Ethan Thompson in Oakfield, oakfield-alabama, play. It was showtime last night at Oakfield-Alabama High School and the Drama Club was ready to shine for the community. And it did. The teens have been preparing to perform two plays since October, putting in two-hours days until recently when they started practing three to four hours a day. The plays lasted around two and a half hours with two brief intermissions in between acts. The first one was about the first Thanksgiving, from the point of view of a young man named Dwayne, who had not done his homework the previous night. Due to his lack of studying, Duane's understanding of the first Thanksgiving was a little skewed. He was not prepared when his teacher called on him to give a synopsis of that celebrated mealtime. In Dwayne's eyes, the Salem witch trials took place at the same time as the first Thanksgiving. He also believed football was invented by the pilgrim men as a way for them to relax and be lazy while the women did all the work. In the end, Dwayne's teacher got so fed up with his inaccuracies she asked him to stop. The second play was about the Brookshire family's annual Christmas letter. Mrs. Brookshire asked her family to help her write it but they declined for various reasons and excuses. So she gave up and decided to write it herself. We then got a glimpse of the big events that happened during the year as she wrote them down in her letter. In the end, the rest of the family realized how important writing the letter was to Mrs. Brookshire, and they helped her finish it. The following are some video clips from some interviews I conducted with some of the main characters. posted by Ethan Thompson in oakfield-alabama, Veterans Day. Every year Oakfield-Alabama Middle-High School hosts a Veterans Day celebration. They invite anywhere from 15-25 veterans from around the area to come and give a presentation on how the military has changed their lives and what it was like to be in the military. If the veteran went to war, he is asked to bring memorabilia such as metals, helmets, etc. This year they had approximately 18 veterans come and share their stories. Several generations were represented. Some of the veterans included in this year's program were James Neider, Pastor Mark Perkins, Red Robinson, Leonard Gordon, Ray Cianfrini, Clayton Fry and Wallace Kornow. The event is coordinated by Patricia Trinder, a middle school math teacher, who is running it for the first time by herself. When asked why she wanted to take over coordinating the event she said “I've always felt it was a special thing that needed to be continued.” She'd helped run it in the past, but when Darlene Bakos retired she handed the reins totally over to Trinder. We asked some of the veterans if they thought other schools should hold events like this one. “I hope that other schools and communities would really take time to educate people of the value of their veterans,” said Cianfrini. posted by Howard B. Owens in football, sports, Oakfield, oakfield-alabama, High School. With Oakfield-Alabama and Cal-Mum trading scores through the first three quarters of their quarterfinal sectional playoff game tonight, and both teams seemingly able to run the ball at will, it became evident as the fourth quarter started that the winner would be decided when one defense or the other made a stand and stopped a drive. On its first drive of the fourth quarter, the Hornets couldn't get past the Red Raiders 40 yard line and Cal-Mum took over on downs. Minutes later, the Red Raiders were in the end zone and with a two-point conversion, and obtained what would prove to be an insurmountable lead, 30-21. The Hornets would score one more touchdown, but fall short by two points, 30-28. "It came down to them just pounding the ball at us and not getting away from what they do best," said Hornets Head Coach Brian Palone after the game. "They made the plays when they needed to make the plays." The two-point margin can also be explained by two failed point after attempts. In the second quarter, kicker Jon Fisher hit an upright, and in the third quarter, a high snap spoiled the attempt. The Hornets got off to a quick start when Fisher placed a perfect onside kick down the far sideline and OA scrambled and took possession of the ball. The offense then marched the ball 45-yards down the field for a score and a 7-0 lead. Matt Osmancickli scored that TD on a one-yard run. But the home team answered right back, bringing the ball down to the one-yard line, where Trevor Haut was able to shove his way into the endzone. Cal-Mum tried for a two-point conversion, so the score was 7-6. Cal-Mum answered right back, putting a long drive together that ended with a Trevor Haut three-yard TD run. Jon Cappotelli carried the ball in on the two-point conversion, giving his team a one-point lead, 14-13. OA grabbed back a one-point margin when a high snap on a Cal-Mum punt attempt was kicked out of the back of the end zone for a safety. That made the score 15-14 Hornets. Both teams scored again in the third quarter. But with a muffed extra point attempt and a successful two-point conversion, Cal-Mum was able to convert another two-point try, so now the Raiders were up 22-21. The Raiders were able to stop Oakfield-Alabama on its fourth-quarter drive and immediately answer back with another touch down. This time it was on a 19-yard pass from Mike Anderson to Dan Whiteside, plus they tacked on two-more points. The Hornets found themselves in a bit of a deep hole, down 30-21. But OA kept fighting, engineering another drive that culminated in a one-yard rush by Osmancickli and an extra point from Fisher, making it 30-28, which is how the game would end. The Hornets got off to a slow start this season with Coach Palone taking over the program for the first time and finding himself with few returning seniors. Palone and other coaches around the league will tell you that OA has been a team that has improved greatly every week as the season progressed. Palone said tonight he's proud of the progress his team has made. "I thought this was the best game we played all year and that’s all I can ask of them, to just get better every game," Palone said. NOTE: About the video -- yes, I miss my high-def camera. It won't be repaired for another six weeks. posted by Tasia Boland in schools, oakfield-alabama, alumni, hall of fame. Saturday evening at the Oakfield-Alabama High School, the late 1st. Lt. Harmon J. Norton, Dr. Kenneth Bradt, Dr. Robert B. Diasio and Donald R. Carroll were inducted into the O-A Hall of Fame. The Hornets' gymnasium was filled with about 100 friends and family of the inductees. O-A students, Jennie Beverly, Leah Snyder, and Ashley Colopy introduced each inductee with a short bio. Wess Audsley, CEO/Director of the Genesee/Wyoming YMCA introduced Donald Carroll. First Lt. Norton’s grandson, Harmon Norton accepted the award on behalf of his grandfather. He came all the way from Texas because of a quick Google search on his grandfather's name. He said the first thing that came up was the article from The Batavian. Once he started reading, he realized it was about his grandfather. He contacted Joe Cassidy, the Oakfield Town Historian, and arranged for a visit. It seems as though he's been following his grandfather around, from enjoying the same hobby of airplanes and piloting, to being where, a 100 years earlier, his grandfather grew up -- in Oakfield. He thanked The Batavian for its story. When Dr. Bradt came to the podium, he not only got the audience laughing but enlightened us about the impact others have on your life and decisions. He started with a joke about making just a few notes for his speech while pulling out paper upon paper. Then he joked about his popularity with his female classmates, but sweetly gave the credit for his happiness to his wife of 62 years, Thelma. He ended his speech challenging the audience to give some thought to the people who have made a difference in your life and to tell them how they influenced you. YMCA official Audsley shared memories of Carroll and the struggles Carroll had as a child. “He will do just about anything for people looking for help,” said Audsley. He said Carroll’s drive to help others is so they don’t have to go through what he went through. The picture above is of previous and new inducted members. Below are this year's inductees by themselves. The audience stood up as Carroll walked up to the podium with tears of gratitude flowing down his cheeks. I got goose bumps. The moment seemed magical. I felt hopeful and strenghtened as I listened to comments about Carroll's community contributions, and knowing all the inductees -- past and present -- have given above and beyond for others. My husband even felt uplifted. The ceremony made me realize that people don't remember the material things as much as they do the moments spent with those they really care about. posted by Melissa Haacke in parade, oakfield-alabama, Halloween. posted by Tasia Boland in batavia, Announcements, oakfield-alabama, fundraising. When people have a strong motivation that drives them to devote all their time and effort to something worthwhile, they are bound to find happiness; at least this is the case for Batavia resident Donald R. Carroll, who has spent countless hours helping local youth. He is one of four inductees for the Oakfield-Alabama High School Hall of Fame ceremony, which takes place the first weekend in October. For the last 35 years, Carroll has lived by his motto, “Pay it forward.” He graduated from Oakfield-Alabama Central School in 1974. Instead of following the trend of going off to college after getting his diploma, Carroll decided to join the workforce and focus on his passion for helping less fortunate children. For his first organized project, he partnered with the Genesee/Wyoming YMCA to raise money to send kids to camp. The fundraiser was successful for 23 years. Erik Fix, branch director of the Genesee/Wyoming YMCA said Carroll has collaborated with the organization over the years on many different occasions. Fix said most recently they have combined efforts on Don’s Secret Santa fundraiser to give gifts to children at Christmas time. This fundraiser started because Carroll wanted to ensure every underprivileged child he was aware of was not disappointed on Christmas morning. This project has recently been expanded to provide grade school kids with supplies for school and winter coats. Shortly after the camp fundraiser, Carroll switched his focus to helping students with college expenses. He started a 5k and 10k run in Batavia that ended in 2005 to support the Genesee Community College Foundation. In 1997 he was named Geneseean of the Year (A person who has made an outstanding contribution to the community, contributed or volunteered beyond the call of duty and who is a resident of Genesee County) by the Chamber of Commerce. Donald R. Carroll, the quiet, shy orphan who by chance grew up in Oakfield, NY, has become a true “Guardian Angel” of the less fortunate children of Genesee County. Donald credits his success to having grown up in Oakfield and attending OACS where one individual in particular took a special interest in him. Donald will always be indebted to Coach Bill Burns for guiding him in high school, and getting him his first job as a counselor at YMCA Camp Hough. Coach Burns taught him by example about lending a hand, "paying it forward." 1. Write your check to "Dollars for Scholars"
posted by Tasia Boland in oakfield-alabama, alumni, marine corps. Sometimes we get so caught up in our everyday tasks, we tend to forget those who've helped create the life Americans enjoy. Like the late 1st Lt. Harmon J. Norton, for example, who served his nation admirably during the Great War. He graduated in 1913 from Oakfield-Alabama High School and served in the Marine Corps. He was widely regarded as one of the best fliers in America. Joe Cassidy, the Town of Alabama historian, will be representing Norton at the O-A Hall of Fame induction ceremony at 5 p.m. Oct. 3. After graduating high school, Norton studied law at the Detroit College of Law. For two years during college he was a clerk for the New York State Legislature and the Constitutional Convention of New York State. In 1916, he joined the military and two years later he was appointed as an officer in the air branch of the Marine Corps. During World War I, Norton served as a flying instructor at various air bases throughout the country. The lieutenant was known as an able and skilled aviator, an "ace" famous among his fellow officers and aviation enthusiasts. Along with piloting planes, Norton also represented defendants in court martial trials. His success in court had him traveling to different parts of the country to defend men facing court martial. In 1923, his focus was back on aviation. He was appointed to command a newly established land airplane squadron at Pensacola, Fla.
Captain J.J. Raby, Navy Commandant at the time, described Norton as a pilot of long experience and sure ability especially in landing planes. Raby also noted him as an exceptional all-around officer particularly valuable to aviation. Norton became the aviation liaision officer in the Marine Corps of the expeditionary forces. This position is responsible for handling all matters between the force and its flying section. His skill at making short trips quickly and manipulating safe landings on hazardous fields were the primary reasons he was selected for the job. Norton was going to compete in the Schneider Trophy, a prize competition for seaplanes. But he died in 1926 when a military plane he was testing crashed into the Potomac River. Norton's grandson, who lives in Texas, and granddaughter, who lives in Florida, plan to attend the ceremony.